Welcome to the Master Kai Ying Tung Academy of T'ai Chi Ch'uan. 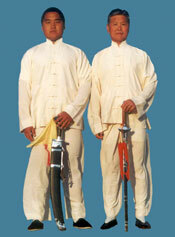 Here you will find information about our school and many resources for the further study of Tai Chi. Master Tung Kai Ying, is a third generation master who is internationally renown and has practiced and taught Tai Chi for over fifty years. Our students are fortunate to have the extended opportunity to attend Tai Chi Camps and Workshops put on by Master Tung throughout the world. We are centrally located here in Los Angeles and welcome new students of all ages and abilities. Thank you for visiting our web site and please feel free to contact us at any time. For more information please call (310) 951-5683.